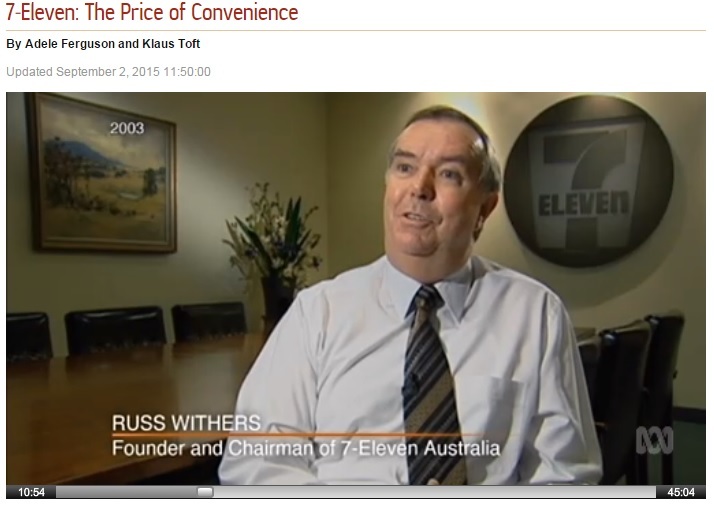 7-Eleven (version Australia) and Big Franchising: conspiracies of fraud, extortion and theft. I have defined Big Franchising and the role of industry enablers elsewhere. Click here to watch a 45 minute expose called 7-Eleven: The Price of Convenience. Modern franchising runs identically, internationally, on all countries sharing a British Common law heritage. The highest levels of national government known full-well for decades that wage theft is largely responsible for the extraordinary ROI that is achieved by franchisors such as Mr. Withers and Ms. Barlow. see Immigrants as prey on WikiFranchise.org.